What It’s About: Society is falling apart under the weight of the flesh-eaters unleashed in Night of the Living Dead. The manager of a TV station (Gaylen Ross), the station’s traffic copter pilot (David Emgee, and two SWAT team members (Ken Foree and Scott H. Reiniger) flee Pittsburgh in the copter, not sure where they want to go except away from the city that has descended into chaos. The group takes refuge in an enormous shopping mall, which they secure (at great cost) from the dead. How long can they hold the mall (and their sanity) in a world overrun by the hungry dead and desperate living? Why Watch it Today? : Bible thumping broadcaster Harold Camping has predicted that the world will end today. The Dawn of the Dead remains one of the bleakest looks at the end of the world ever made, and yet, it does contain a tiny note of hope, so here’s to Camping being wrong yet again. 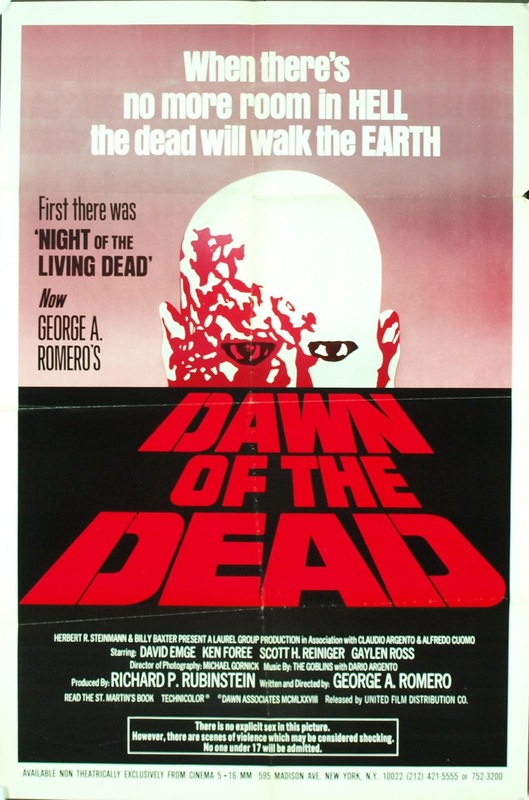 Note: Dawn of the Dead is available in many cuts; personally, I’d start with the Theatrical Cut over the European Cut and either over the overly long, plodding, so-called “Director’s Cut” that was really Romero’s rough cut from Cannes. This entry was posted in Horror, Independent, Movie of the Day, Sequel, The Original, Zombies and tagged Claudio Argento, Dario Argento, Gaylen Ross, George A. Romero, Goblin, grindhouse, helicopter, Ken Foree, low-budget, mall, National Guard, projects, pundits, racists, rednecks, scientists, SWAT, talking heads, Tom Savini, United Film Distribution Company (UFDC). whatever fanzine at the time of it’s 1978 release thought of an alternate ending…of the black guy on the roof wanting to die, be left behind, but at last moment, reaches out for the helicopter, to fly to safety. the fanzine thought the 1960s romero would have had the character just miss catching the helicopter, to stay trapped on the roof.